Many generals of the American Civil War sharpened their teeth in Mexico, even the ones whose performance left President Lincoln bemoaning their posting. 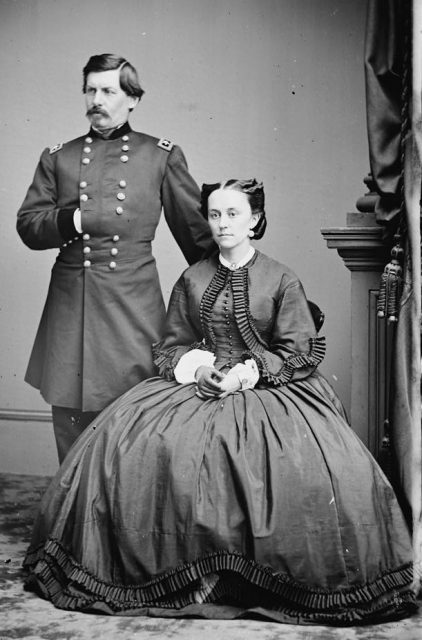 In Mexico, at least, those future generals served with distinction, and George Brinton McClellan, President Lincoln’s future rival, was no exception. 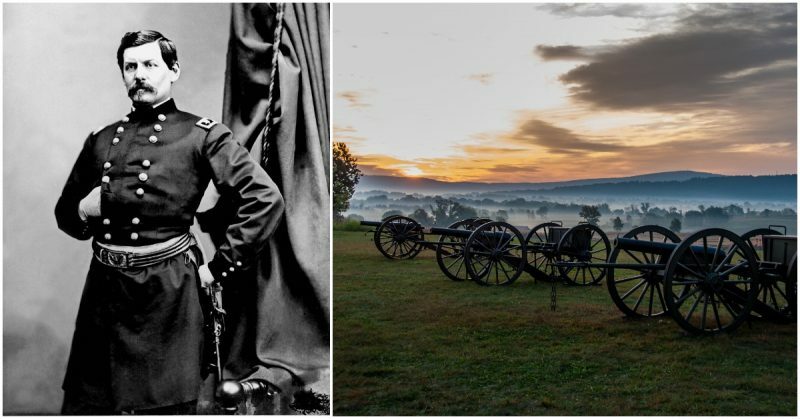 Serving gallantly under both General Zachary Taylor and General Winfield Scott, the future general’s career was a long line of lessons learned. 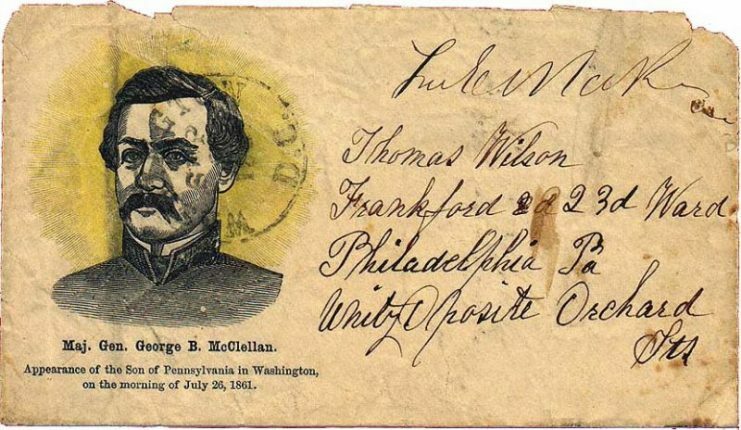 Like many future Civil War generals, McClellan graduated from West Point. Graduating second in his class in 1846, when war broke out between the United States and its sister republic Mexico, McClellan eagerly went to war. In October, McClellan arrived at the Rio Grande. Like a nineteenth-century Rambo, the young officer arrived armed with a double-barreled shotgun, a brace of pistols, a saber, his officer’s dress sword, and a Bowie Knife. Unfortunately for the over-eager officer, he arrived too late for combat. Patriotic cover honoring the arrival of Maj. Gen. George B. McClellan in Washington, D.C., on July 26, 1861. That would soon change. Breveted to second lieutenant and assigned to the Corps of Engineers, McClellan’s excellent knowledge of logistics and construction were put to use as the Army, after getting transferred from the Rio Grande to Matamoros, started building roads and trails as they marched to Tampico. Arriving in January, the young lieutenant sailed with Major General Winfield Scott’s army to Vera Cruz. Arriving with the vanguard, McClellan immediately went to work aiding the siege. Once more putting his engineering skills to work, McClellan assisted the effort to scrape battery emplacements in the hard-packed Mexican dirt. With their support, the last forts defending the city surrendered, and Vera Cruz fell into American hands on March 29, 1847. 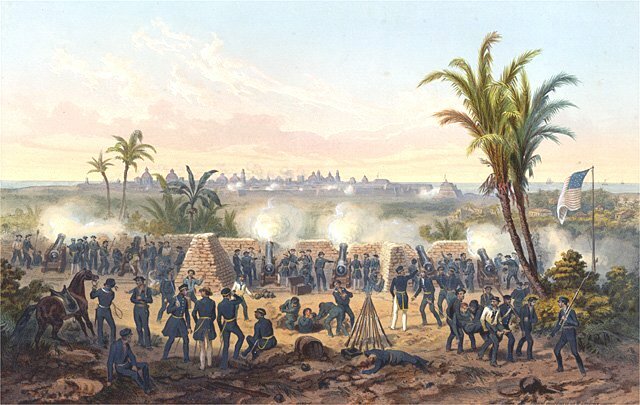 Battle of Veracruz during the Mexican-American War. Slowly but surely the army advanced towards Mexico City, McClellan putting his talents to use as the Americans faced the Mexican defenders standing between them and the capital. Along with engineering work, McClellan ably served as a scout. His reconnaissance work at Mexicalcingo was noted by General Scott as exceptionally dangerous due to its proximity to the nearby fortified position of El Peñon. It was during this daring scouting effort McClellan was saved from Mexican lancers by another future Civil War general, a young Lieutenant Beauregard, who came to his fellow officer’s aide along with three dragoons. McClellan met another future Civil War general at the Battle of Contreras. At the battle he came to the aide of Magruder’s battery, taking command of the guns in place of their wounded commander. Receiving a grape-shot wound himself, battery member Thomas Jackson took command of the remaining guns. Mexico City Battles. Molino del Rey is on the left. “O” depicts a Mexican battery, “P” an American battery, and “R” is Steptoe’s battery. At the storming of Padierna, Lieutenant McClellan’s sappers led the way for one of the American brigades to storm the Mexican defenses. No less than three generals, including General Scott, would praise the sappers and miners for their efforts at Padierna and other battles on the road to Mexico City. Like many future Civil War generals, McClellan served gallantly at the assault on Mexico City. Though he did not take part in the initial assault on Chapultepec, he did aid in the direction of American artillery during the early assault on the city. 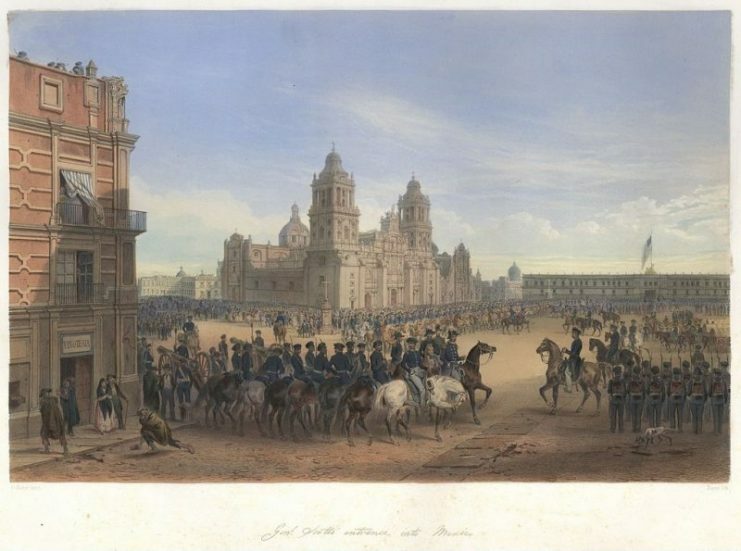 Winfield Scott entering the Plaza de la Constitución, Mexico City. With the outer defenses of the city breached, McClellan and his sappers formed the vanguard of General Worth’s prong of the assault. 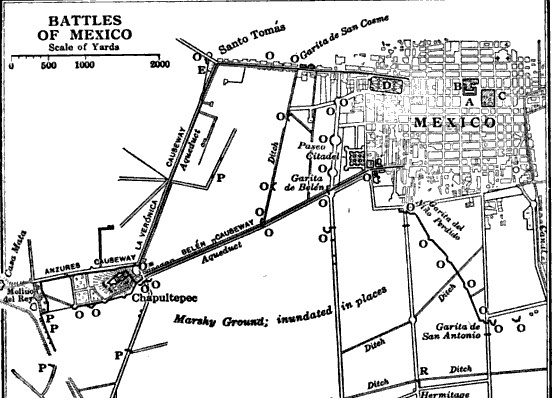 The seizing of the San Cosme gate proved to be some of the most perilous actions of the attack on Mexico City. McClellan braved streets well covered by Mexican sharpshooters and artillery. He and his sappers dashed and dodged through intense fire to sap their way to a house overlooking a Mexican artillery placement overlooking the gate. Thanks to their precise fire, the guns were silenced, the gate taken, and Mexico City that much closer to capture. 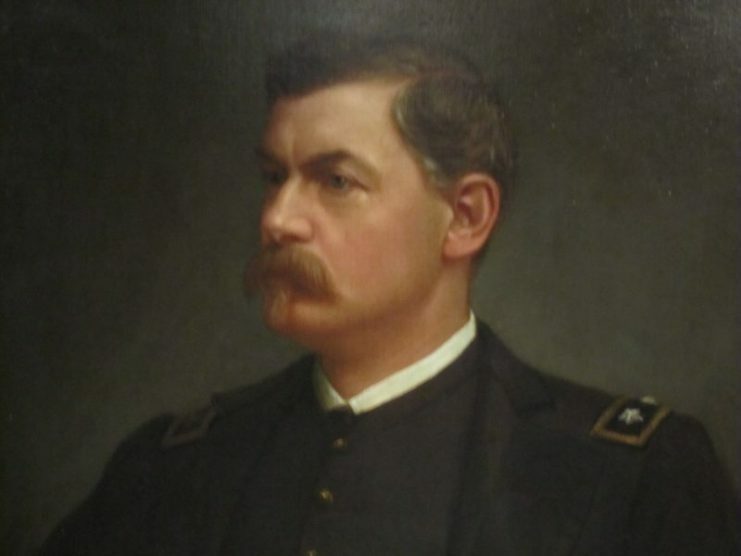 portrait of McClellan in the National Portrait Gallery in Washington, D.C.
For his brave actions throughout the war, McClellan would receive two brevet promotions, ending the war a brevet captain. After the war, he continued to pursue engineering and logistics. When the American Civil War started, McClellan received the geriatric General Scott’s position. Though he did an excellent job organizing the American Army, he did a much less able job commanding it. An excellent engineer and logistics experts, his skills had been put to much better use in the previous war.